In November’s Italian food issue we dove deep into L.A.’s most notable pizza places, trying to find out what makes their pies tick. Olio, for instance, ferments their dough for a full 24 hours for a funky tang and Sotto’s pizzas are cooked at 900 degrees for less than a minute to get their signature leopard-spotted char. Pizzaiolos bragged about what kind of wood they used to fire their pies, where their ovens were imported from, and what hyperspecific regions of Italy they repped. Prova corrected us that they were not doing Neapolitan pizzas, but rather a Neapolitan-Bari hybrid. We had to Google where Bari is. 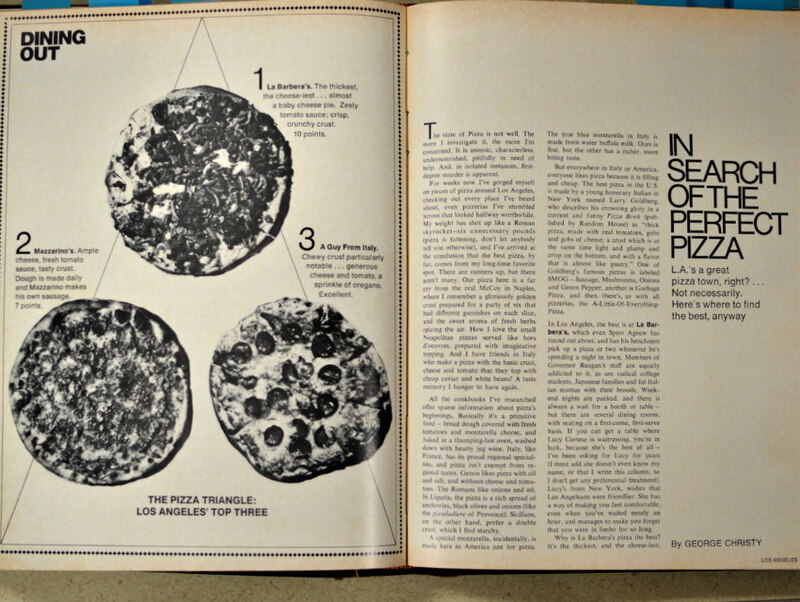 And then we stumbled upon this L.A. mag issue from 1971, where writer George Christy ranks the city’s top three pizzas, as seen below. Oh, how the times have changed. Perhaps oversimplified from the short descriptions, but it seems like the biggest deciding factor in the decision was… cheesiness? Mazzarino’s had ample cheese, A Guy From Italy had generous cheese (is that more or less than ample? ), but then La Barbera’s won top honors with what was unequivocally the “cheese-iest” pizza in the city. It was so cheesy, in fact, that it almost resembled a baby cheese pie. We have no idea what that means. Out of all three restaurants, Mazzarino’s is the only one still standing, though it was closed for several months due to a kitchen fire in 2009. Stop in for a slice of Angeleno pizza history.